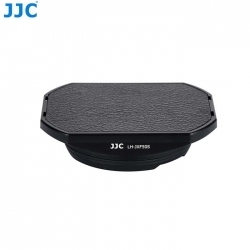 JJC LH-JXF50S Bayonet Lens Hood is designed to prevent unwanted stray light from entering the lens by extending and shading the end of the lens. The non-glare matte finish on the inside further prevents or limits lens flare. No vignetting will show with the hood on. The main body of the lens hood is made of high quality aluminum alloy. Besides that, the bayonet is made of synthetic resin, which will not damage your lens. With the extended lens end, you will also benefit from extra protection from accidental impact. The lens hood is equipped with a cap for better protection of your lens. The hood also allows you to put on a Ф46mm filter and a Ф46mm lens cap. The whole lens hood maintains the aesthetic of the lens and camera system. JJC LH-JXF50S is compatible with FUJINON LENS XF50mmF2 R WR.